We believe one of the keys to your financial future is a careful investment plan, no matter what stage of life you are in. Developing personalized investment plans for our clients is the core of our business. As financial advisors, we will work with you to set and help you pursue your long-term financial goals through the services and products offered by Stifel. Our dedication to helping you pursue your financial goals is unsurpassed. Only after careful consideration of your current financial situation can we identify an appropriate plan to pursue those goals. Our goal as a team is to establish new and mutually rewarding relationships with clients. 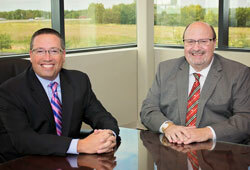 Our team's primary focus is on assisting clients with their retirement planning needs. We will tailor an investment program around your specific goals and risk tolerance. Whether we utilize individual stocks, mutual funds, private money managers, CDs, bonds, or a combination of products and services, we will work with you to develop an asset allocation plan to help pursue your short- and long-term goals. We believe in strong individual relationships that stand the test of time. We truly believe that by placing your needs and interests first you will prosper. Over the years, we have developed an acute understanding of various services, products, and investing styles to help create specific strategies for you based upon your personal objectives. Stifel has established itself as one of the nation's leading wealth management and investment banking firms. The resources it provides offer innovative, creative, high-quality, and value-added products and services to help you pursue your goals. We offer a free review of your portfolio, which will enable us to assist you in determining the appropriate investments for you. Everyone has a different comfort level, and your portfolio needs to be customized to help pursue your individual goals. Click here to e-mail us for additional information. Stifel, Nicolaus & Company, Incorporated Member SIPC & NYSE.